Consider the case of Jose Rizal reported in yesterday’s Jakarta Post, but not online. Apparently he has been seeking asylum in the USA because he was harassed and discriminated against by Muslims here, including friends, relatives and an aunt who made him leave her home after he converted to Christianity in 1984. His original application in 2000 was turned down because his knowledge of the Bible was flaky – he thought Jesus was responsible for the Ten Commandments. That there were mitigating circumstances, such as death threats, have now been taken on board by the 2nd US Circuit Court of Appeal. Jose has since married a US citizen, who he met in church, so he’ll probably be allowed to stay. Now that’s okay for Jose, but is he aware that persecution of Christians is on the rise in the US? In Madison, Wisconsin, the Freedom from Religion Foundation distributes anti-Christian pamphlets to public school children entitled, “We Can Be Good Without God.” The entertainment industry and syndicated media increasingly vilify Christians as sewer rats, vultures, and simple-minded social ingrates. What’s that saying about sticks and stones …? It’s also a good job that Jose isn’t gay like other Indonesian asylum seekers in the US because if he were he’d suffer further discrimination. Anyway, that many US citizens have similarly flaky Christian viewpoints as Jose is in no way relevant, but mighty interesting anyway. 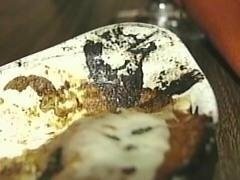 For example, a man in California claims the image of Jesus appeared to him while he was eating a plate of manicotti at an Italian restaurant. Leo Williams said the image appeared before his eyes in the form of a bubbling, burned portion of cheese on his pasta dinner. Williams showed several people at the business who said they also saw the Jesus image and began to take photos of the discovery. Williams said since the lunch, a chronic stomach problem he has had since birth has vanished. I’m glad Williams is feeling better. Could it be because he’s stopped eating pizza? Another Jesus has been asked to change his name. Bosses at a Stockholm hospital have asked a nurse called Jesus to change his name, after concerns that it might cause confusion among patients. According to Jesus, an auxiliary nurse at Huddinge hospital, his superiors were worried that patients told “Jesus will be coming soon,” might get the wrong idea. Talking about asylum, and I don’t really want to discuss the diplomatic row erupting because Australia granted temporary visas to 42 asylum seekers from Papua, did you know that three years ago the wife of one of Suharto’s cronies also sought asylum abroad? The wife of a former Soeharto government minister, the tycoon Mohamad “Bob” Hasan, is seeking refugee status in Australia, claiming she fears persecution as a former crony of the regime if she is forced to return to Indonesia. Justice Shane Marshall said that she had a well-founded fear of political persecution as a Soeharto crony because her husband had been exposed to excessive or arbitrary punishment while in prison. Evidence was given to the court that in 2001 Hasan was transferred from the low-security Cipinang penitentiary in central Jakarta to the notorious maximum-security prison on Nusakambangan island. The Jakarta Post reported the then justice minister, Baharuddin Lopa, saying the move was aimed at deterring the corrupt, and as a security measure. This is, of course, the home away from home of Tommy Suharto. I’d be interested to know of the current whereabouts of Mrs. Hasan given that hubby Bob is back roaming wherever Suharto’s buddies roam. So there’s something to be said for bar gossip after all. But the Indonesian blogosphere has much greater credence thanks to Yosef. Did u both really understand Yosef? You surely have seen Jakarta Eye’s clearer argument, even if is not yet complete. It still seems to me to be wheels within wheels. Yes saw Jakarta eye, your point I am having dumb day must be missing it.